After celebrating the spirit of Independence, the most loved festival of the year came i.e., Diwali which everyone excitingly waits for the entire year. At Velocity, things are usually done the unconventional way and there’s always something to look up to the occasion of celebration. This Diwali, everyone had already guessed how things would work out with Rangoli making competition, diya painting and more. But, the Human Resource team had something completely opposite planned for all the Velocitians. 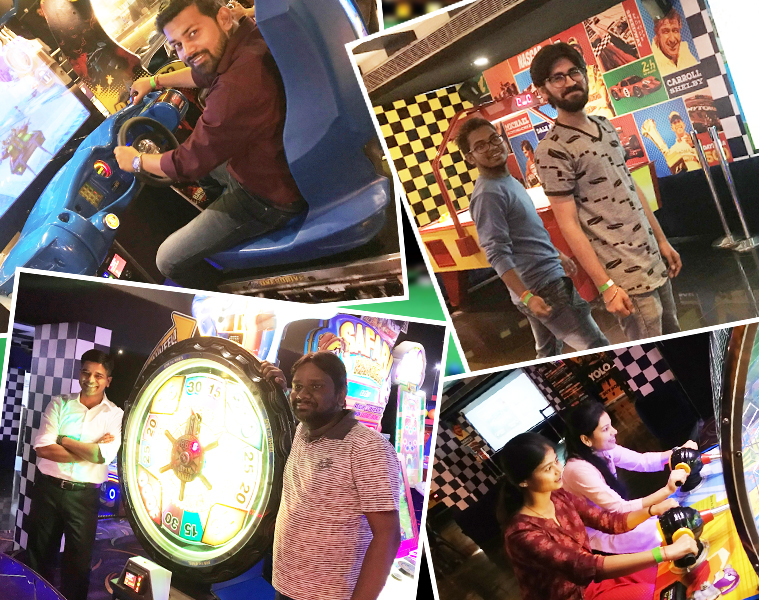 With a sudden mail with the subject line “Spark Up the Festive Mode with a Fun-Filled Outing”, every employee had a big smile on their face. What added to the cheer was the venue that the management had decided. Glued Entertainment…as amazing as it sounds, it is probably one of the best places for games and food together. Taking the celebrations to the next level, the employees were asked to be in ethnic wear to give a twist to the day. 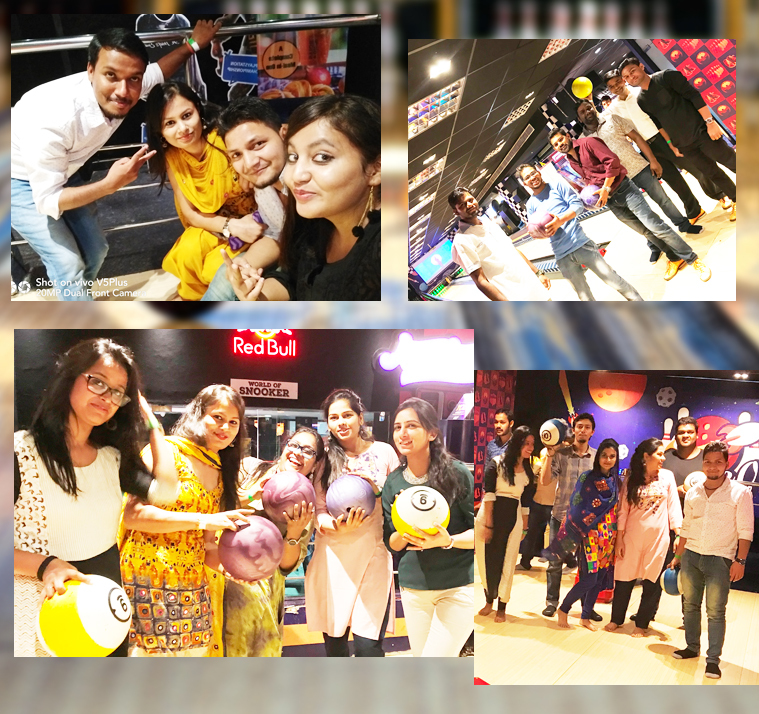 Starting the day by complementing each other on how beautiful they looked (all the women of the company) and the photo session which is a customary at Velocity, 17th October 2017 started. With all the photo session done, everyone got back to their daily work tasks and patiently waited for 3:30 pm. Talking about the outing and the excitement giving butterflies in the stomach, finally, the time came when the boss came and said, “please wrap up..we’ll leave now”. With these golden words, everyone started to shut down their laptops and headed to their vehicles and reached Glued. Welcomed with a gaming band, everyone started to explore the place that looked quite interesting. Starting with the biggest attraction Bowling, there were innumerable games to put your hands on. From Basketball, Air Hockey, Fooseball, table tennis, pool, snooker, the list went up to the hunting games, Ps4 and so many more. Within minutes of exploration, the entire place was literally hijacked by the Velocitians and you’d see them indulging and enjoying every game that they laid their hands on. After so much of enjoyment, finally, the HR announced that the food was being served and what could have been better? With pizza slices from Chicago Pizza to vegetarian and non-vegetarian rolls from Rolls Kings, there were Paneer Salsa wraps, cold drinks, nachos and more to gorge on. After having the taste of everything served on the table, everyone felt even more energetic and got back the last rounds of games that they could play. The party had to come to an end at 7 in the evening, so it was finally the time when the big family came for a photograph. Everyone sat or stand according to their comfort and smiled for the shutterbugs. The Diwali celebration came to end by bidding bye-bye to one and all, but that wasn’t the end of celebration at all. 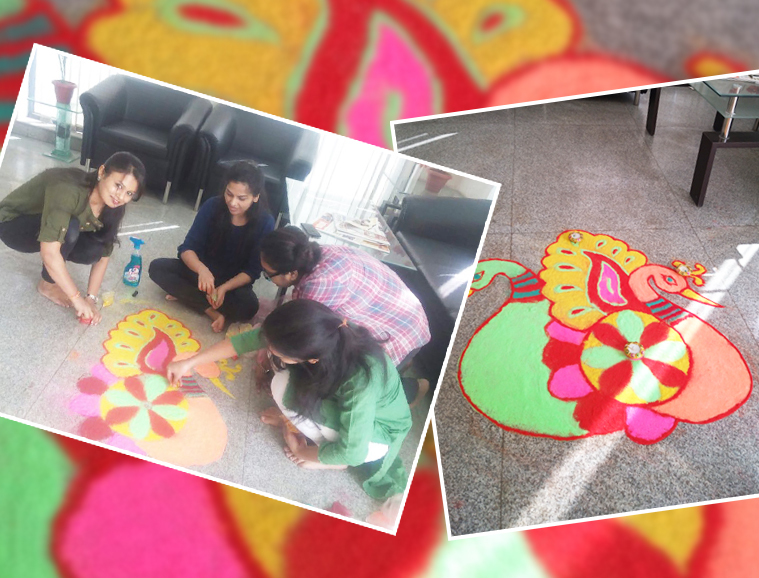 The next day the women of Velocity came together to make a beautiful Rangoli in the reception area to welcome festivities at Velocity. Happy Diwali!! It indeed was a sparkling and fun celebration.